I hope you guys are ready for the best Valentine’s party ideas ever! Even though the holidays are over, we still have plenty of reasons to throw a great party! ;) Valentine’s Day isn’t just for couples anymore either. This year we are celebrating the girls with the perfect party for you and all of your friends. Put on your party hats and get ready to host the cutest Valentine’s celebration your girlfriends have ever seen! Thanks to our amazing friend Lauren from Going for Grace, we have the best tips for having the best Galentine’s Day party ever! Here’s what Lauren has to say: With Valentine’s Day right around the corner, we wanted to share some feminine inspiration for your Galentine’s Day plans! I have always loved the purpose of Galentine’s Day. What better way to celebrate Valentine’s Day than with a group of your closest girlfriends?! 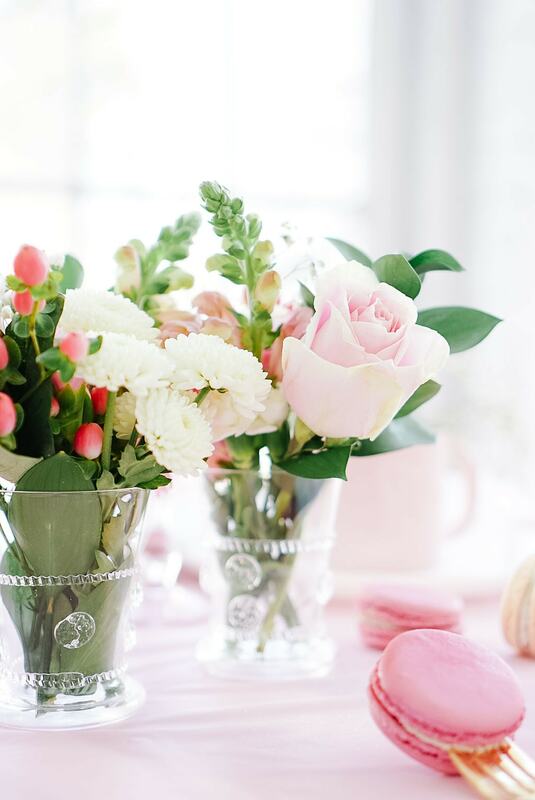 This party was filled with feminine details that I am dying to share with you! 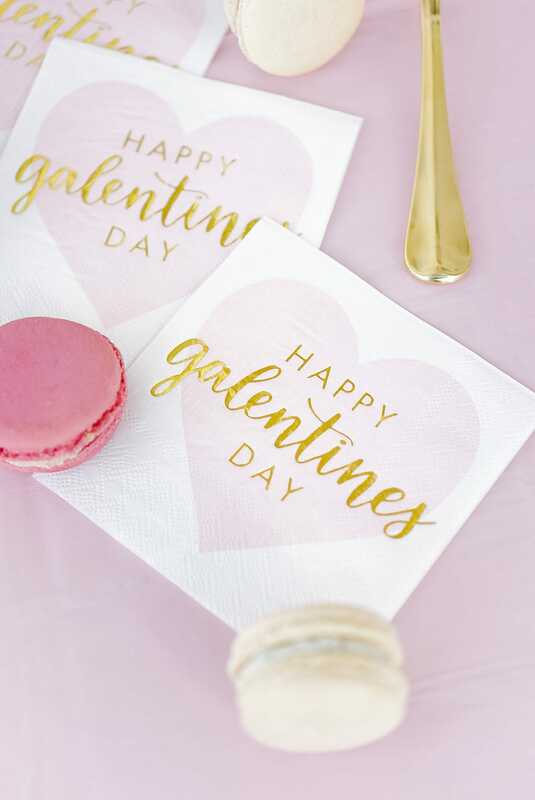 Here are some cute ideas to add to your Galentine’s Day party. 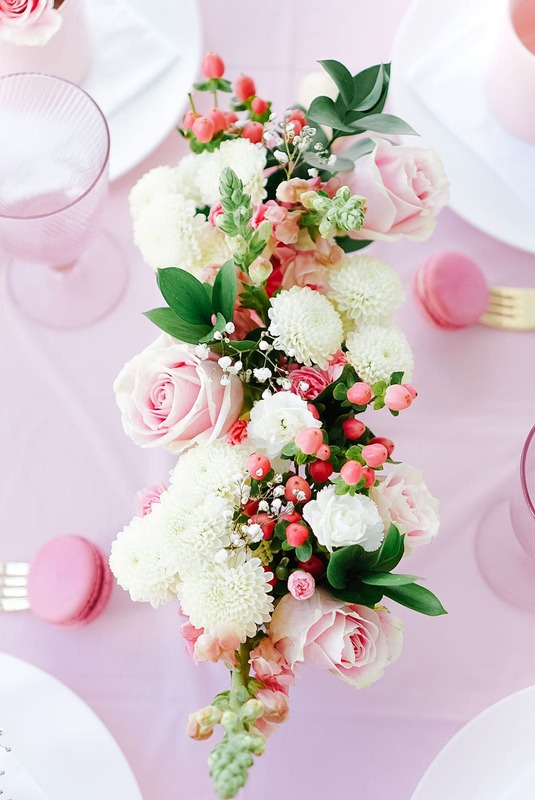 To me, there is nothing more feminine than flowers in shades of pink. For this party, I set each place setting with its own floral arrangement. 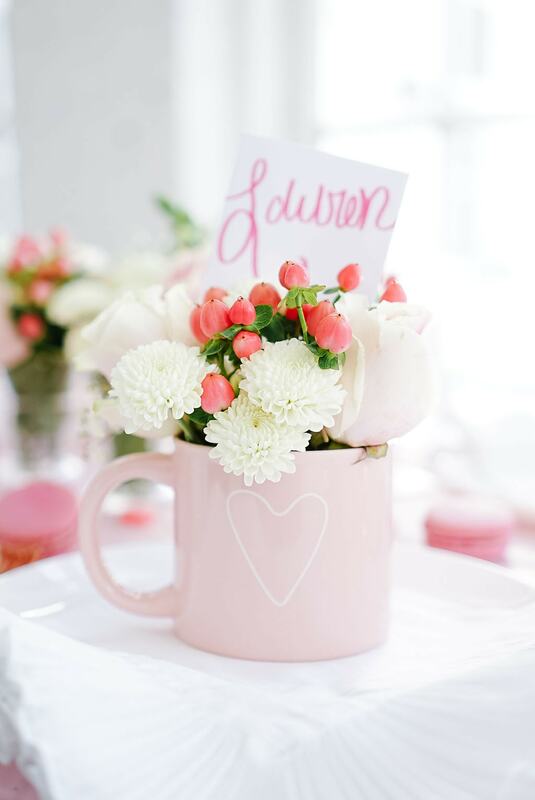 To make these arrangements, I found the most precious heart coffee mugs to serve as the vase along with a floral pick to serve as the name card for each place setting. There are many options when it comes to a vase, but I wanted guests to be able to take their arrangement home so I chose these blush heart mugs. Inexpensive, but so cute! To add a special touch to the name card, each name was written on the envelope of a Valentine’s Day card. Not only do these arrangements serve as a beautiful place setting, but also a special party favor for each guest to take home with them! This may very well be my favorite part about this party. 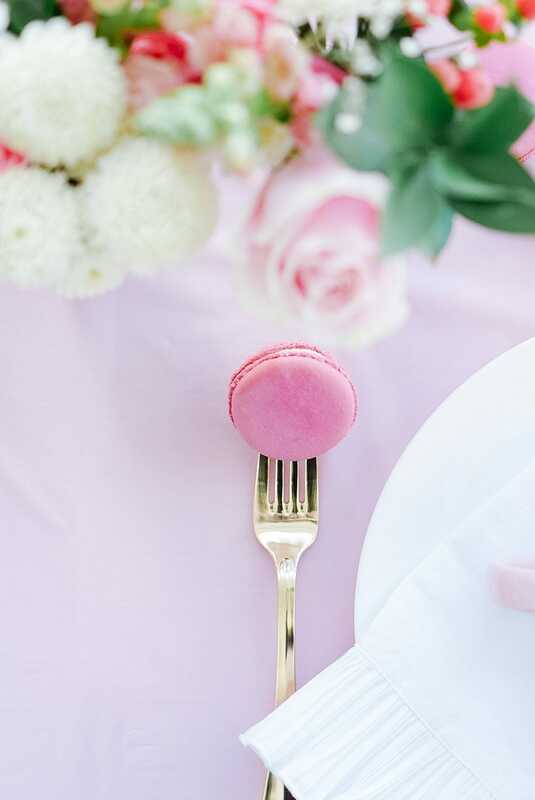 While planning, I knew I wanted to include macarons on the menu and in the table setting. Macarons are the way to a girl’s heart, right?! What I didn’t expect was how adorable they look placed on the end of a fork. Simply slide the fork gently into the filling and place next to the plate. Trust me, your guest will rave about this darling detail for weeks to come! I would argue that Valentine’s Day has the best gift bags of any holiday. Witty sayings on pastel colored bags…Yes, please! 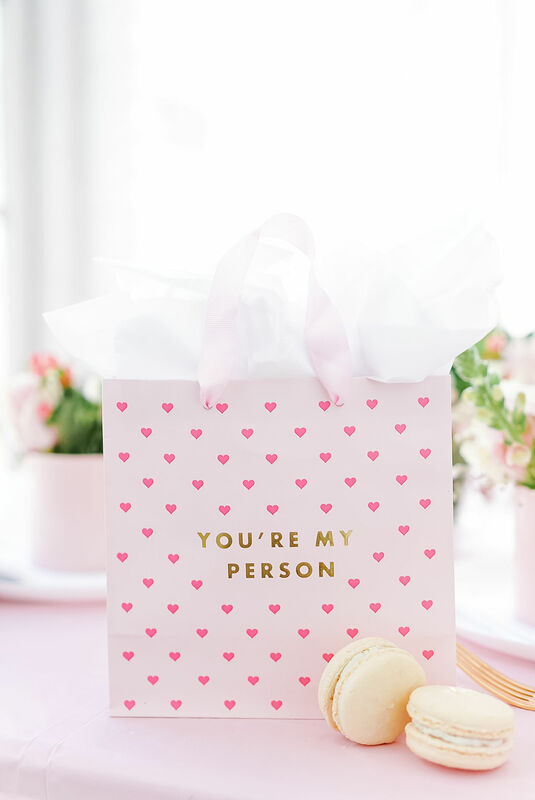 A cute and unexpected way to decorate for a Galentine’s Day party is to fill the room with these cute bags. 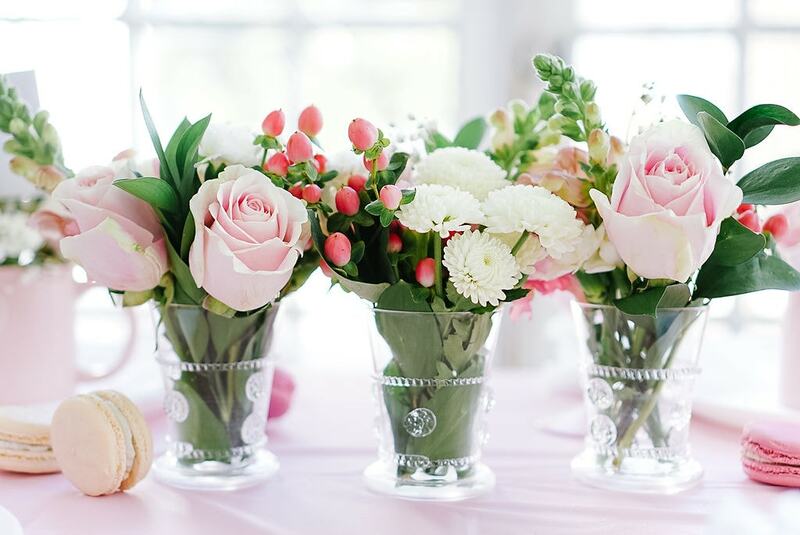 This small detail elevates any party, whether you place them around the table, in the windows, or at the front door. If you already have presents for each guest then this is a win-win, but if not then simply fill each bag with a little tissue paper and use them as decoration! Let us know if you end up throwing a Galentine’s Day party. We’d love to see all of the details you decide to incorporate!